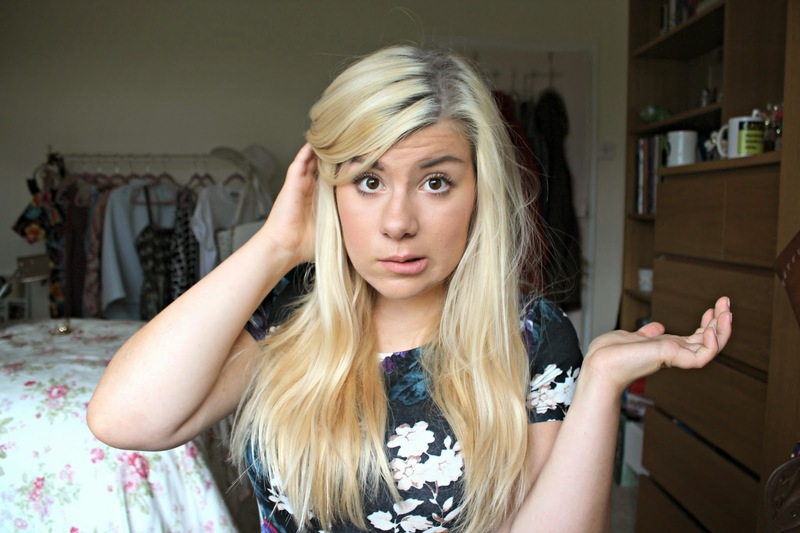 Not So Plain Jayne: Bleached Blonde Hair Care 101. So we all know that bleach is pretty nasty stuff. I mean..we use it to disinfect toilets. So why on earth do we put it on our hair? Not that it's the same bleach...but still, the effects can be pretty stressful on your precious locks. I myself have been getting my hair bleached for just under 9 months and always get complimented on how healthy my hair looks. So I've compiled a little list for you lovely folks on how to keep your tresses looking as beautiful as you are! 1 ) Don't expect it to be an overnight job. Firstly unless you already have pretty light hair, it's going to take a few rounds of bleach before you get your dream colour. I get my hair dyed every 2&1/2 to 3 months as I'm not bothered about having roots, but I also feel this gives the hair chance to recover. However if you really can't stand the roots then the best thing to do is ask you hairdresser the shortest gap you can leave between appointments. 2) Leave it to the professionals. You might think why pay out to go to the hairdressers when you can get an 'at home' dye for less than £5? While I agree that having it readily available at your fingertips can be tempting, you have to consider what if it goes wrong? I know far too many people who have fallen in the trap of being promised 'Platinum' hair from any colour. In actual fact they've ended up with a bright yellow mop. At the end of the day you're paying the hairdressers because they have been trained to dye hair so have a little faith and spend a little more to have fabulous coloured hair. 3) Dry Shampoo inbetween washes. For those of you who are burdened with overly oily hair this one is a must. I wash my hair every 2/3 days to ensure I don't overly dry out my hair by washing away all the hair's natural oils. however, if you hair is looking a little on the greasy side then a good old spritz of dry shampoo is the way to go. I adore the Batiste range, especially this one in the floral scent. Not only does it keep oil at bay but it can provide some much needed volume when styling your locks. A winner in my eyes! 4) Purple Shampoo. You don't want to spend all that hard time & effort getting your hair to the perfect shade, only for it to turn an awful custard yellow after a week. This is where Purple Shampoo becomes a godsend. Somehow or other it counteracts the brassiness and leaves your locks looking lighter and brighter. I've been using the John Frieda Sheer Blonde Colour Renew Shampoo .I use it every other time I wash my hair and honestly after a couple of uses of this my hair looked completely transformed. Well worth the money! 5) Condition. Condition. Condition. I cannot stress enough the importance of conditioner. When you bleach your hair it strips it of all the moisture - leaving it dry and fragile. Therefore you need to replenish the moisture by using a good conditioner. Some of my favourites right now are the Garnier Fructis Repair & Shine Conditioner and the Herbal Essences Beautiful Ends Conditioner. I tend to squirt a good size dollop into my palm then evenly distribute it only through the ends and midlengths of my hair. I avoid the root area to prevent getting greasy hair. I then pile it on top of my head and put a showercap on while I continue the rest of my shower routine. This helps to contain the heat and lets the conditioner do it's magic. Then after around 5 minutes I take it off and wash it all out. 6) Use a wide tooth comb. Bleached hair is a pain to brush at the best of times - so when it's wet it's at it's weakest state and needs extra care. Using a wide tooth comb ensures that there is less strain put on the individual stands. After this step try using a Tangle Teezer. They're a great new way of brushing your hair without pulling at the shaft and leaving your tresses tangle free! Definitely worth the money. 7) Avoid heated hair tools. These can wreck havoc with your hair, causing split ends and breakage. Try to let your hair air dry as much as possible and find alternative ways of styling your hair, such as milkmaid braids or a chic topknot. If it's absolutely imperative for you to use heat then make sure you invest in a good heat protection spray, this gives the hair that extra barrier against the heat. My personal favorite is the Tresemme heat defense spray. 8) Invest in a good hair oil. Hair oil is literally a miracle worker when it comes to coloured hair.I love the Wella SP Luxe oil as it can be used on wet hair to help make it softer and silkier.Alternatively on dry hair to help smooth away fly aways and give your locks that extra shine boost. Again concerntrate the application to the ends and midlengths of your hair - then brush through from half way down to relieve the knots and gradually working upward to distribute the oil more evenly. Wow this was a lengthy one wasn't it? I hope this has helped you blondies out there - or infact anyone who was considering bleaching their hair. What are some of your haircare tips? Let me know!